The Invacare Matrx PS Cushion is anatomically contoured wheelchair cushion made of high resilient foam with a waffled ischial relief recess for superior postural support. The foam is placed in an inner cover that's breathable and moisture resistant to protect the foam. It can be spot cleaned as needed. The outer cover is reversible and is made with special Dartex™ fabric that's stretchable with a knitted surface or a smooth surface. The fabric is durable, easy to clean, breathable and incorporates Ultra-Fresh™ for antibacterial and odor protection. When needing to be laundered simply unzip it and remove from foam and then zip back up before placing it in the washing machine. Hang dry or tumble dry after washing cycle. 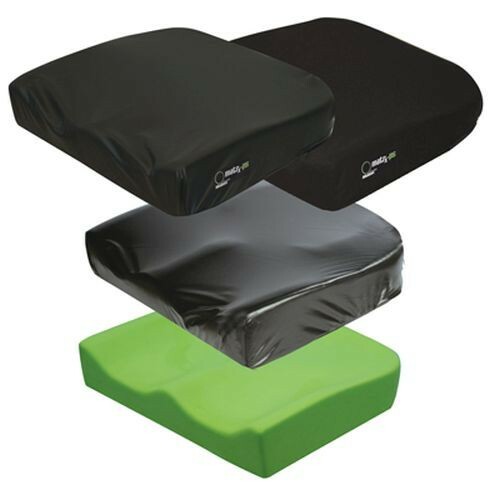 When needing a replacement Matrx cover, Vitality Medical supplies a variety of sizes for a proper fit for your cushion. Frequently check skin condition after installation of cushion.